ABOVE: Andrea Chin, the chef during our cruise, prepares to announce the day's lunch menu while hostess Ivana Veic mixes a drink at the bar. 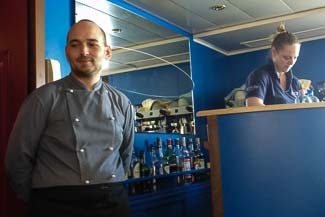 Food is an essential part of the barge-cruising experience, with an emphasis on quality and what the French call terroir. On La Bella Vita, passengers enjoy meals that are prepared from fresh ingredients by a chef and a sous-chef. Breakfast: Each day starts off with breakfast, with serving hours depending on the day's cruising and touring schedule. (On a typical day, breakfast might start at 7:30 or 8 a.m. and continue for an hour and a half or more.) A breakfast buffet offers croissants, rolls, ham, cheese, cereals, fruit, yogurt, and the occasional cake or tart, or Venetian cookies (see inset photo). If you wish, you can order hot dishes, such as bacon and eggs or pancakes, from the kitchen. Lunch. Depending on the touring schedule, lunch is either a buffet or a three-course meal with a set menu, followed by cheeses and dessert. (Lunch is always served on board--you'll never be sent ashore with a box lunch.) Some of the lunches have geographical themes, such as "Lazio," "Campagna," or "Ferrara." Dinner. This is the culinary high point of the day, with a different regional theme every night. A typcal dinner consists of an appetizer, a first course (such as risotto or pasta), a main course, two different cheeses, and dessert. Special food requirements: When you book your cruise on La Bella Vita, you'll be asked to indicate any food allergies, dietary needs, or food preferences on a guest questionnaire. The chef will then be able to plan special dishes just for you. On La Bella Vita, as on most barges, all drinks (including wine) are included in the fare. You can get mixed drinks and espresso at the bar before or after dinner, and you're welcome to serve yourself when the hostess isn't on duty. In the dining room, you'll find a Nespresso-style coffeemaker and a refrigerator case stocked with beer, wine, mineral water, and soft drinks. The hostess, who doubles as a sommelier, serves two wines (normally white and red) at lunch and dinner, choosing wines that fit the menus and any regional themes.